Slightly Offens*ve’s Elijah Schaffer and journalist Michael A. 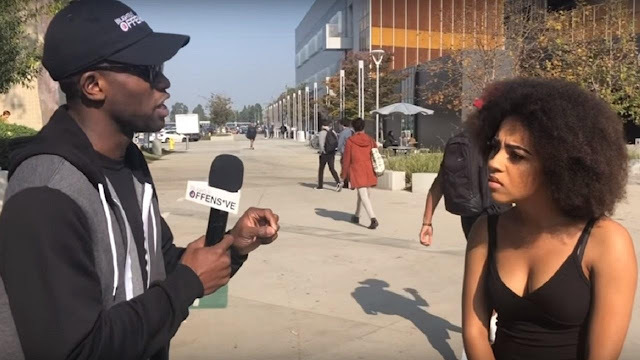 (@the_blackmic) headed to Orange Coast College in Costa Mesa, California, to ask students for their opinions about building the wall on the U.S.-Mexico border. In every case, the conversation — which was meant to be about illegal immigration — quickly turned to racism. We should get rid of the wall so people can work in the U.S. illegally, then go home to Mexico more easily. The wall is a bad idea because President Donald Trump is a racist who “doesn’t comment on white nationalists.” And by the way, black people can’t be racist. People could simply use ladders to go over the wall or tunnel under it. The wall is purely to keep out Mexicans because white people only want white immigrants. Non-unionized counties like “Norway” and “Germany” are “kicking the s**t” out of the U.S. economy and educational system.